KANDY NUWARA ELIYA TRAIN – How do I take it? Is it good? Home / Travel Sri Lanka / KANDY NUWARA ELIYA TRAIN – How do I take it? Is it good? Are you interested in taking the Kandy Nuwara Eliya train? There is a lot of talk about taking this journey from Nuwara Eliya Kandy train (or vice versa) as one of the major tourist attractions in Sri Lanka. The scenery is indeed beautiful! The tracks were open for business around Christmas of 1864, which is considered a remarkable achievement both in terms of speed in the pre-industrial era of the island and of engineering ingenuity and excellence, as will become clear on your trip. The scope of the rail line steadily increased during British colonial days and by 1927, there was 1530 km of track in operation. The railway was initially built with purely commercial interests in mind. First to transport coffee from the Hill Country to the coastal port of Colombo, then when the coffee crop was wiped out by disease, the embryonic crops of tea that Sri Lanka is now famed for were transported to the coast for exportation. As the armies of the Portuguese and Dutch would testify too accessing the rolling hills, waterfalls and endless plateaus of the Hill Country is not easy. Thus the rail lines gradually became a connector for people, offering the intrepid tea planters ‘the wild men of the hills’ the chance for a bit of refinement in Colombo. You should check out Seat61.com for a timetable for the Kandy Nuwara Eliya train. Not all of the trains go through Kandy, and Peradeniya is the alternative. You can take the train from Peradeniya station – about 7 km from Kandy – to Nanu Oya – about 8 km from Nuwara Eliya. There are 2 daily trains – departing Peradeniya at 08:40 and 12:23. We have had customers who have dropped the tuktuk off in Ella and taken the train, and those who have driven through. There are pro’s and con’s for each. In the end, the train can be great but it is unpredictable, travelling with the tuktuk gives you the freedom to stop and enjoy all the views, take a photo and even explore some of the surrounding waterfalls! Will the train be full? Will you get a seat with a view? Even then, we had friend who managed to hop on the train at Kandy but were standing up in the coridoor without a view… after riding it for around 30 minutes they decided to hop off and head back to Colombo to pick up a tuktuk from us (they had already rented the tuktuk but went to do the train trip first in case they were missing something). Don’t get me wrong, if you get a good seat on the train, looking out of the window moving forward – or even sitting in the door – it’s an amazing experience. 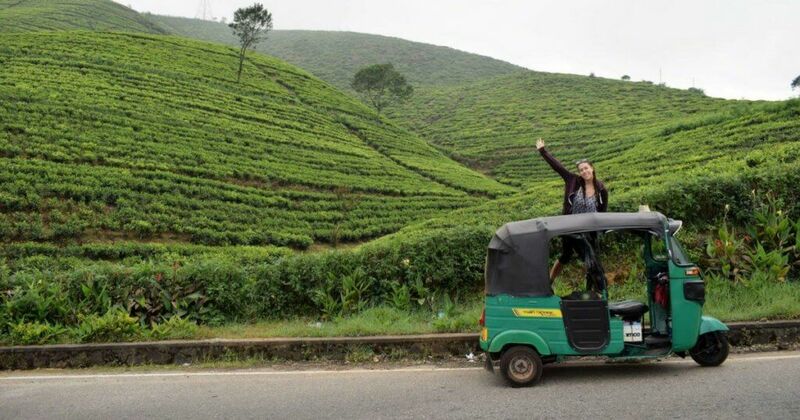 You can however see similar views and explore the drive at your own pace if you are in your own tuktuk! Another traveller (Andy) who took a minibus instead of a train had this to say! We were going to get the train but due to not being able to guarantee a seat we decided to go by mini bus. That was the best decision we have ever made in 20 years of travelling. The road journey over the mountains into the tea country is mesmerising and you are Able to stop for loads of photo ops on route. We also toured the lochmuir tea plantation (brilliant, informative and free) stopped to view tea pickers, waterfalls and beautiful vistas. Last time I looked trains don’t stop and cannot imagine it being a better journey. We haven’t tried it yet, but we know you can put motorcycles on the train for LKR 600 one way. If you are still desperate to catch the train with the tuktuk you should roll up to the station and check if you can put it on the overnight train. Let us know when you do!!! And finally – guess where this shot was taken???? Hi l hope to take my grandson to Sri Lanka could l hire a Turk Turk and are they could to drive. Amazing, you will both have so much fun!